Jefferson County courthouse site of the John Brown trial, Charles Town, WV. Charles Town is a city located in Jefferson County, West Virginia. As of the 2000 census, the city had a total population of 2,907. It is the county seat of Jefferson County. 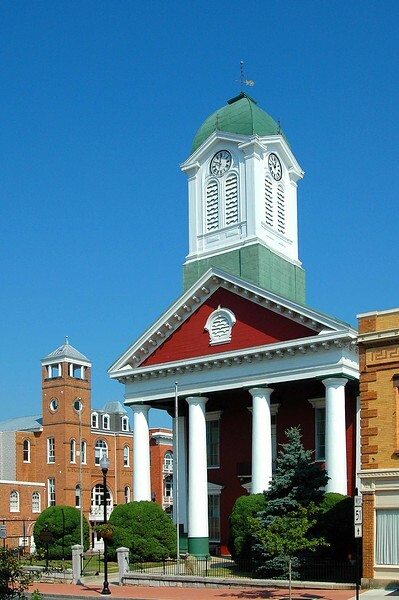 Charles Town was founded by Charles Washington, the nephew of U.S. President George Washington. Charles Washington, the founder of Charles Town, was born in Huntington Creek, now Fairfax County, Virginia, on May 2, 1738. He was the youngest full brother of George Washington. He came to present Jefferson County between April and October 1780. The home of Charles Washington, Happy Retreat, was erected in 1780. In 1786, on 80 acres of his adjoining land, Charles laid out the streets of Charles Town, naming many of them after his brothers and one after his wife, Mildred. He donated the four corner lots at the intersection of George and Washington streets for public buildings of the town and county, provided the town become the seat of the county separated from Berkeley County. Jefferson County was formed in 1801 as he anticipated. The county court house stands on one of these lots, as did the jail until 1919 when it was demolished to be replaced by the post office. Charles Washington died sometime between July and September, 1799, only a short while before the death of his brother, George. His grave site at Happy Retreat is unmarked.